palynological assemblages, not on the extinction event. Sweet and Braman documented occurrences and relative abundances of some individual species and several broader groups of palynomorphs (pollen, spores, and algal cysts) through the stratigraphic intervals at all 12 of their localities. They proposed a sweeping revision of the interpretation of the K-T boundary event and its effects on plants. Their new scenario centered on emplacement of the boundary clay-stone layer, which they interpreted to have preceded the extinction and to have consisted of more than one depositional event. From this they concluded that multiple impacts might have occurred at or around the K-T boundary. In their 1992 paper (and subsequently), Sweet and Braman contended that palynological extinctions were not abrupt but gradual or even stepwise in pattern, approaching the K-T boundary. They stated that within the last tens of centimeters below the K-T boundary, individual samples usually yield fewer specimens and fewer species of pollen typical of the late Maastrichtian than do underlying samples. Despite this, Sweet and Braman noted that if species records from several Canadian localities are summed, most of these late Maastrichtian species are found to range up to or into the boundary claystone. That observation would appear to reinforce the concept of a significant extinction at the K-T boundary. That observation is the basis for Table 7.4. 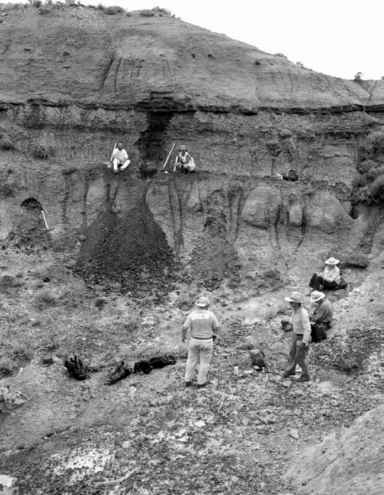 In the late 1990s, Sweet and his colleagues were involved in a major endeavor to gather lithostratigraphic, palynostratigraphic, magnetostratigraphic, and geo-chemical data relevant to events at the end of the Maastrichtian and beginning of the Paleocene. This was the Canadian Continental Drilling Program Cretaceous-Tertiary (K-T) Boundary Project. In this effort, three long cores were drilled in southern Canada: the Elkwater core in southeastern Alberta, the Wood Mountain core in south-central Saskatchewan, and the Turtle Mountain core in southwestern Manitoba. Sweet and colleagues presented previous research on these cores and some adjacent outcrop localities in a series of nine papers in a special issue of the Canadian Journal of Earth Sciences (CJES). Three of them put forward new data concerning the plant fossil record; they are reviewed here. In one of the three pertinent papers in the CJES special issue, Braman and Sweet (1999) outlined the palynostratigraphy of the three cores. They described nine biozones or subzones from the lower Maastrichtian to the middle Paleocene, which they recognized in all three cores. The definitions of most of these palynostratigraphic biozones or subzones were compiled from previously published work, but one zone and two subzones were based on new data from the cores. The position of the K-T boundary - arguably the most significant palynostratigraphic datum in North America - is obscure in Braman and Sweet's stratigraphic scheme. It lies without emphasis between two subzones within a previously described palynostratigraphic zone (Figure 7.37).